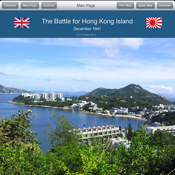 Hong Kong 1941 provides key information on the Battle for Hong Kong which was fought between the British Commonwealth and the Empire of Japan in December 1941. The App is also a useful companion for hiking, as the skirmish areas not only contain the relics of battle but are located in some of the most beautiful countryside of Hong Kong. The App comes well illustrated with these vistas. In addition, map guidance is given, as well as a short quiz for those interested.